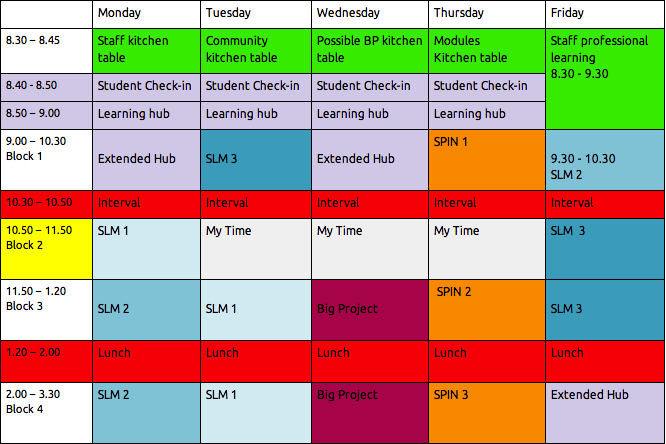 Specialised Learning Modules are co-taught by 2 teachers and last year had 2 teaching blocks, we wanted to deepen this so worked a way for each to have an extra hour this year. We also wanted to leverage teacher-student relationships more to enable learning so students will stay with the same teachers for a semester (2 terms) even though the focus concepts shift in the 2nd term from Culture and Diversity to Relationships. To offer these for all students to get curriculum coverage the teacher pairings were set by senior leadership and presented to staff at the start of this year. 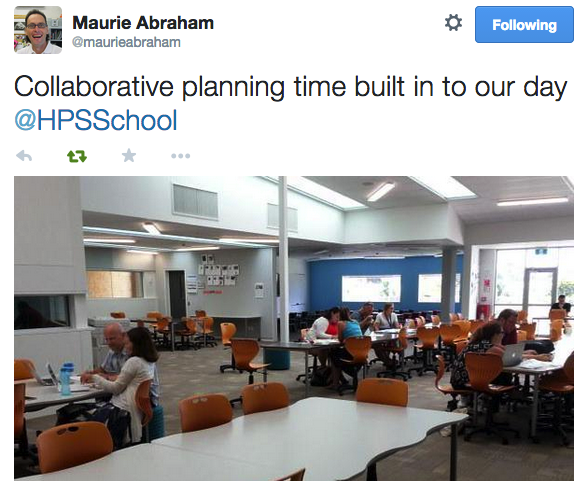 So, gone are the initial planning meetings of 2014 where teachers get together and discuss the focus for their learning areas and pair up based upon obvious links. My initial reaction was “ARGH! What about the authentic connection, are we losing something here! ?” This may have been due to some of my pairings where SOcial Sciences are focusing on the Treaty of Waitangi in Term 2 and I needed to make it work with Algebra and Chemistry???? What has happened though is that the constraints have kicked into gear. They are proving incredibly enabling. To make these pairings work we are having to look deeper and more critically at our Learning Area focus and ask better questions of our co-teachers to more truly understand the crux of what will be taught. Perhaps the obvious connections we based our pairings on last year had made us lazy? Yesterday I worked with Su Min, a new Maths teacher at HPSS to plan our Year 10 module for Semester 1. The focus for Maths in Term 1 is Number while for Social Sciences it is Human Rights. 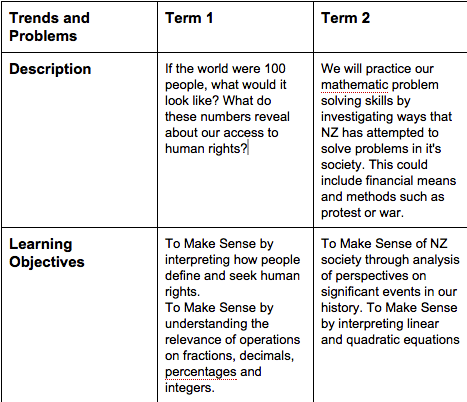 Term 2 Maths is Algebra and Social Sciences is the Treaty of Waitangi and Biculturalism with a wider look at perspectives on significant events in New Zealand’s history. How to make this work? Would these have been modules that would have developed if left to form based on obvious connections? I very much doubt it. The resource constraints we face with numbers of staff, curriculum coverage etc. this year have worked to enable creativity. W ehave had to work at the planning more which means we have come up with ideas to make the situation work. Ideas which are actually looking far better than if we had stuck with what is most obvious to connect here. This hasn’t just happened with my pairings. Many of the staff planning the last 2 days (whilst other staff are still working with our students) have made similar comments. In fact Ros echoed these thoughts on her blog last night. Taking the constraints and using them as an opportunity to enable creative learning design (yes, after an initial negative mental outburst) is hopefully setting us up for a great 2015. Would love to write more on this but I have 37 seconds left of my 28 minute writing constraint, so perhaps some more another time! 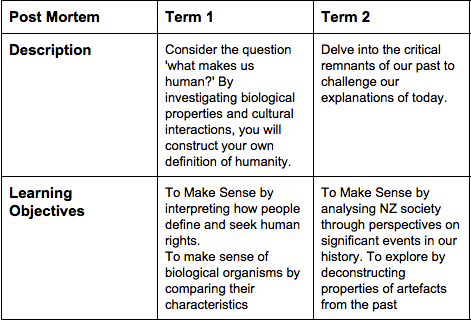 This entry was posted in Uncategorized and tagged #28daysofwriting, creativity, enabling constraints, Hobsonville Point Secondary School, learning design, social sciences, timetable by stevemouldey. Bookmark the permalink. I’m finding tears in my eyes a lot these days. Very powerful. After talking about how to teach and include creativity in our classrooms at #edchatNZ conference, we came to the same conclusion, that there needs to be enabling constraints for students (and teachers) to push against to make them think outside the box a little bit more. Thanks for the great read!